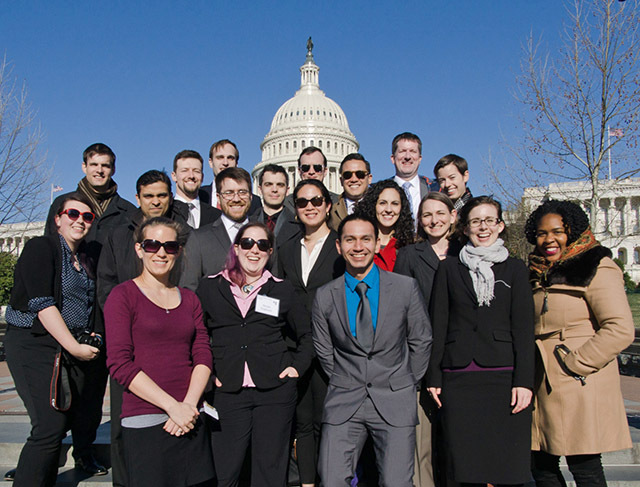 On 21-22 March, 16 members of the American Astronomical Society (AAS) headed to Capitol Hill for AAS Congressional Visits Day (CVD) to get firsthand experience advocating for science. The AAS annually hosts members for visits with their members of Congress to discuss the importance of federal support of research and development programs — including those supported by NASA, the National Science Foundation (NSF), and the Department of Energy (DOE). This group of astronomers, planetary scientists, and solar physicists visited 43 congressional offices representing 15 different states. Some participants met with their senator or representative in person, and many of the meetings led to useful follow-up requests and what we hope will be long-lasting relationships. While visiting with members of Congress and their staffers, CVD participants discussed their work, particularly as it relates to the priorities laid out in the decadal surveys of astrophysics, planetary science, and solar and space physics. These reports represent the astronomical community's consensus on the current state of scientific understanding and the prioritized lists of projects needed to address outstanding questions over the next decade. 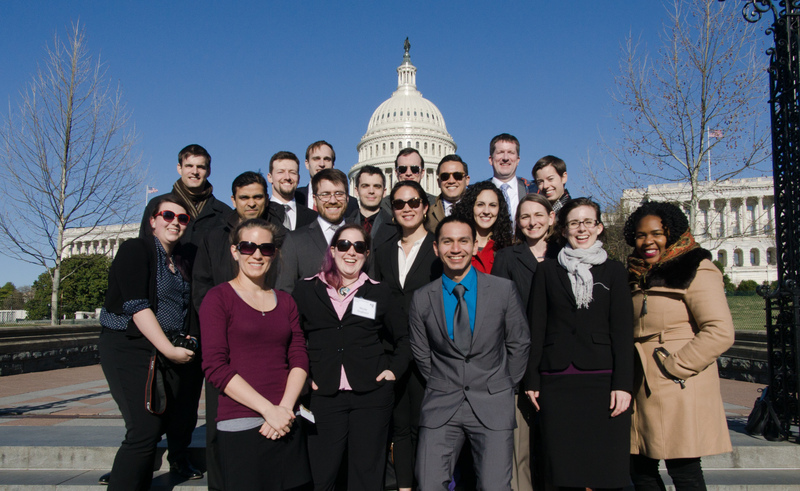 The constituent perspective that CVD participants provided about the importance of federal support for science helped members of Congress understand the local impact of these programs and their significance to virtually every region of the country. Participants also took the opportunity to tell the offices about the total solar eclipse crossing the United States from coast to coast on 21 August 2017. Front row: Gail Zasowski, Nicole Gugliucci, Jesse Rivera, Heather Bloemhard, Jedidah Isler; middle row: Maya Yanez, Karna Desai, James Davenport, Melodie Kao, Vivienne Baldassare, Katie Devine; back row: J. Adam Hughes, Sam Schonfeld, Mitch Ambrose, Ben Elwood, Tom Beatty, Josh Shiode, Joel Parriott, Julie Davis. Courtesy Jesse Rivera. Prior to their visits, the group participated in training sessions and interacted with key division directors at NASA, the NSF, and the DOE Office of Science. These sessions not only prepared participants for their trip to the Hill but also provided them with tools they can use to be effective advocates for science beyond CVD. Karna Desai (Indiana University, Bloomington) comments, "The training and overall experience will help me do better advocacy.” Gail Zasowski (University of Utah) echoes that sentiment: "I feel like I learned a lot, and I'm looking forward to staying as active as I can." “There’s clearly growing enthusiasm among scientists for advocacy — we had six times more volunteers than we could support for CVD this year,” notes Heather Bloemhard, AAS’s John Bahcall Public Policy Fellow. More information about AAS Public Policy programs can be found at https://aas.org/policy/programs. The American Astronomical Society (AAS), established in 1899, is the major organization of professional astronomers in North America. The membership (approx. 8,000) also includes physicists, mathematicians, geologists, engineers, and others whose research interests lie within the broad spectrum of subjects now comprising contemporary astronomy. The mission of the AAS is to enhance and share humanity’s scientific understanding of the universe, which it achieves through publishing, meeting organization, education and outreach, and training and professional development.